2017 was another successful year and the momentum looks to be carrying us into 2018 at full tilt. 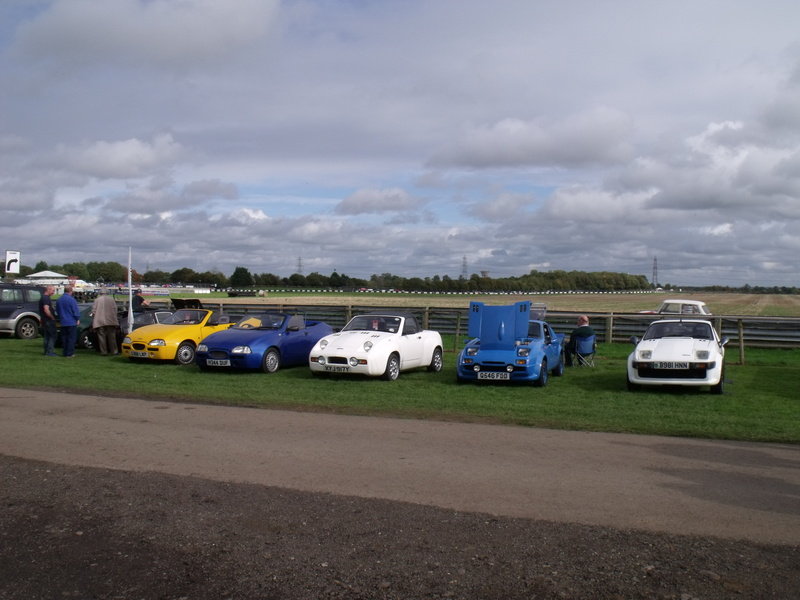 The show season started with the National Kit Car Show, AKA “STONELEIGH, the biggest kit car show in the world”. Once again the club hoisted up its marquee on Saturday afternoon and proceeded to fill the rest of the pitch on Sunday. A busy AGM voted through a revised constitution allowing club ‘steering groups’ to hold online meetings, thus bringing the club into the 21st century. That was followed by the traditional MOC barbeque. 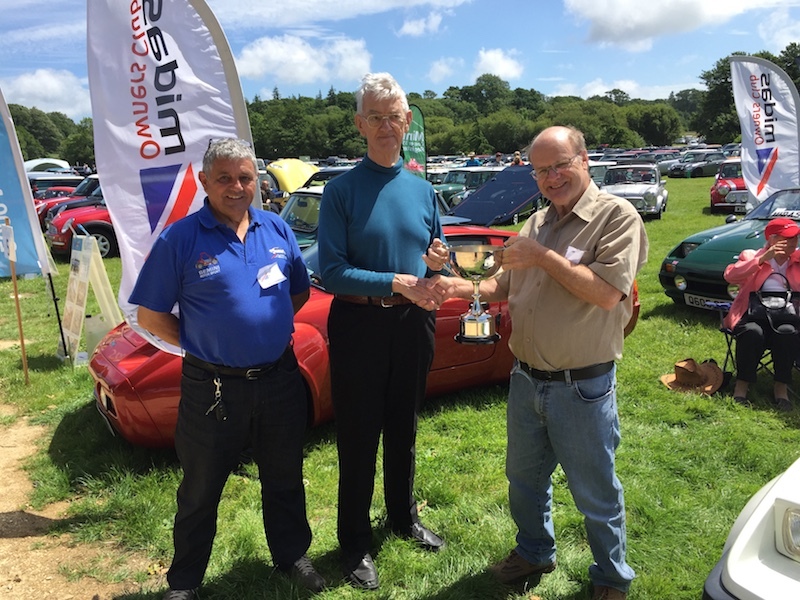 Monday is usually a quieter day, but this year we had almost as many cars turn up as we had on Sunday, thanks partly to two Dutch members, who came to collect the club’s “Furthest travelled” award. This prompted some debate. Peter Camping had come from slightly further afield, but had taken a ferry from Hoek of Holland. Eddie Darwinkel, from just south of Rotterdam, had driven down through Belgium to Calais so took the prize for the most miles travelled in a Midas. 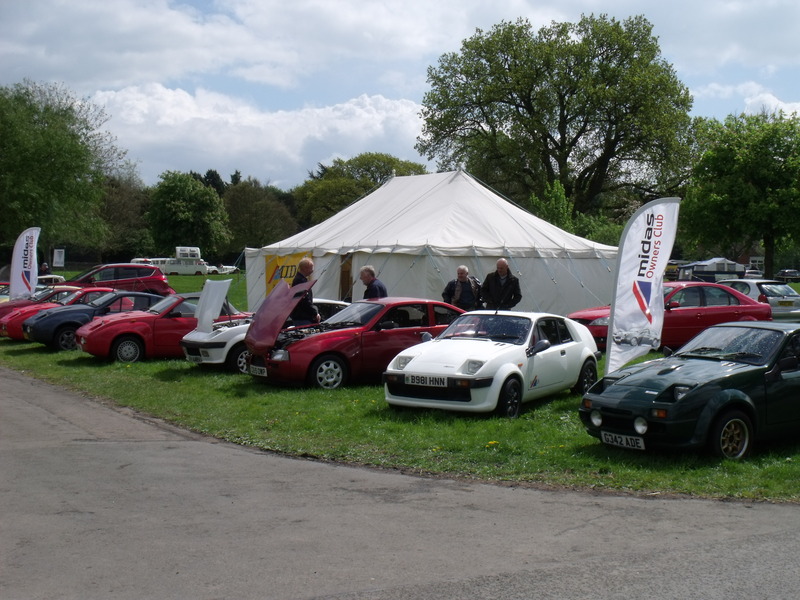 The Prescott Classic Weekend is a chance not just a chance to mingle with other classic cars and their owners, there is also the chance to drive your car up the famous hillclimb course. Those who attended in 2017 have vowed to return in 2018. 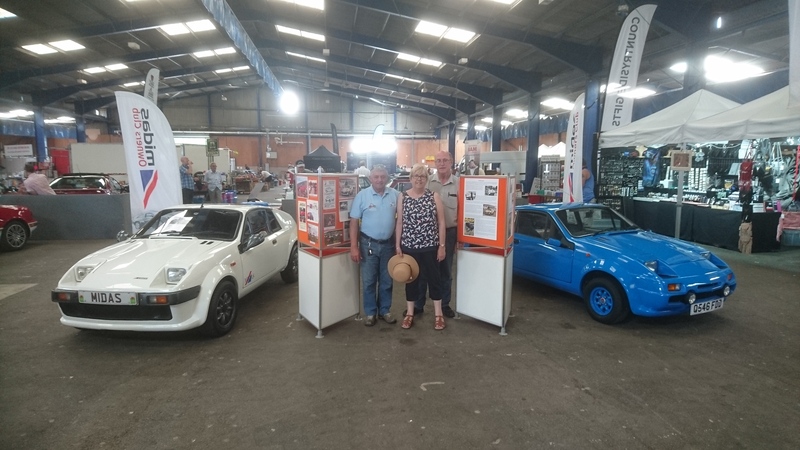 Two shows at Gaydon, on consecutive weekends at the end of May, was perhaps a bit too much to ask for our club members, with just four cars turning up for the British Classic Transport show and a slightly different four cars for the National Metro and Mini Show. 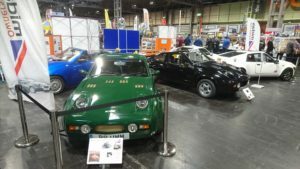 In 2018 Gaydon has dropped the first event so hopefully we should see a better turn out for the more relevant Metro and Mini show. Club member David Stephens organised a parking slot for the club at the Mini Cooper Register Rally, Beaulieu, in early June. This was the first time that the club had taken a slot and we were met by a warm reception. It also gave us the chance to catch up with our former treasurer, Michael Horsley, and award him the Founder’s Trophy in recognition of his many years of service to the club. Our small club stand at the Footman James Bristol Classic Car Show received a warm reception in more ways than one. The show was held on one of the warmest weekends in June. The temperatures were such that we had to make individual visits to the ice cream van situated outside the other end of the hall, otherwise the ice cream would have melted before it had been brought back to the stand. The Bristol Classic is now the biggest car event in the West Country and the club will be taking a stand again in 2018. Castle Combe’s Summer Action Day, should have been called the ‘British Summer Day’, for we had the classic mixture of sunshine and rain. At one point three members were seen finishing off their ice creams, purchased when the sun was at its brightest, whilst stood under brollies. Those who ventured out on track were also treated to the full mix of weather, from perfectly dry to rivers running across the tarmac. 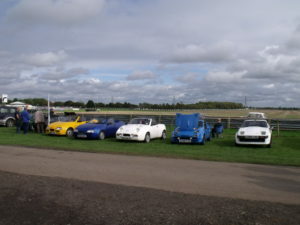 We actually had five cars in total, the photo being taken late in the day after two had left, plus a couple more members who arrived in non-Midas transport. August was quiet as usual whilst September kicked off with two outdoor events – The Haynes Rare Breeds Show on the first Sunday of the month and the Stanford Hall Mini Fair, the following weekend. That gave us a couple of weekends to get our breath back before returning to Castle Combe for the Mini Action Day. Unlike our previous visit, in July, the weather was fairly settled. Too settled perhaps as the sun only got a few rare chances to show through the clouds. This didn’t deter our enthusiasm and whilst our numbers were down on previous years we made up for it with variety, with nearly every model of Midas represented. 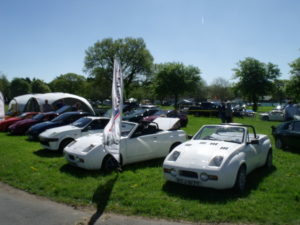 October was another quiet month, with the defunct Exeter Kit Car Show now just a distant memory. November started with a return to the Royal Bath and West showground for the Classic Restoration show. 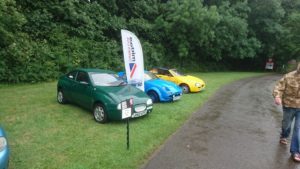 As this event fell one weekend before our ‘big adventure’ it was relatively low key with just two cars on show. The ‘big adventure’ being the club’s debut at the biggest classic car event in the UK, the LANCASTER INSURANCE CLASSIC MOTOR SHOW, POWERED BY DISCOVERY, to give it its full title, or the ‘NEC Classic’ as most people call it. We squeezed five cars onto our stand, ranging from Neil Franklin’s “Chassis Zero” Mk1 to the Mk4 of, er, Neil Franklin again! 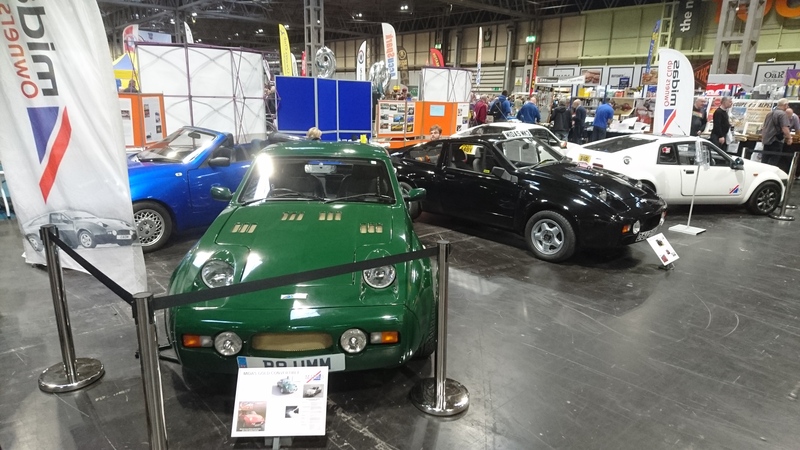 In between we had Meredith Phillips’ superb white Mk2, Chris Nicholls’ very original black Mk3 Gold Coupe and Stephen Kennedy’s excellent British racing green Gold Convertible. 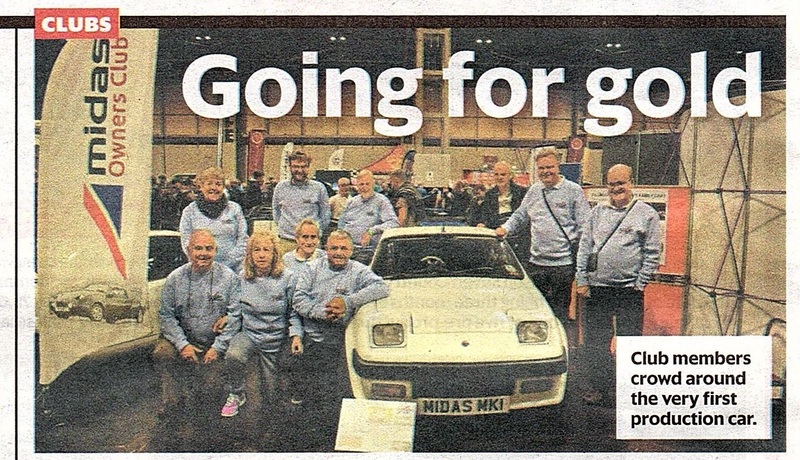 As well as the cars we had a good turn out of club members, all resplendent in pale blue Midas Owners Club sweatshirts. We all pitched in helping out on the stand each day, making sure that any visitors were met with an enthusiastic reception and that any questions were answered in full. 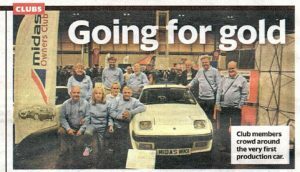 Our efforts were rewarded by a feature in Classic Car Weekly and an invitation from the show’s organizers to return again next year. With the Midas marque hitting 40 years old in November 2018, you can bet that we will be keen to hold a suitable birthday celebration in Birmingham.